So I got home from work one afternoon to find my neighbor was in the process of having solar power installed from the bright green trucks of Solar City. It turns out the Solar City salesperson was on site during the installation, so I decided to wander over and get the down low on solar power. My single family home is located in San Mateo County on the SF Peninsula in Northern California. This is important because the pricing model might vary depending on where you live. The electric portion of my PG&E bill is around $40 a month, which means I don't surpass the first tier in PG&E's pricing tiers. Tier 1 is 16 cents, Tier 2 is 19 cents, Tier 3 is 28 centers, Tier 4 is 34 cents. The house's roof is large, flat, south facing roof, which is the most optimal for solar panels. I currently live in the house with my wife, but plan on having kids in the near future (aka higher electric bill to come). We don't have any electric cars and I don't anticipate owning one in the foreseeable future. The quote and numbers I got are effective Aug 2015. This is important as pricing may fluctuate over time. Moving on! The Solar City salesperson used my PG&E bill to download my power usage into their system to determine the best setup. The basic idea is they'll look at my previous full year usage of electricity to determine the optimal number of solar panels I should install. Too many panels and I'll be selling back power at very low rate. What worked for my situation is 8 panels that would generate 2956 kWh per year, and so all numbers are based on my panels. There are three different plans with Solar City. Power Purchase Agreement (PPA), Lease, and Own. I won't cover owning , which is more or less straightforward. PPA and Lease are more interesting. For both PPA and Lease, SolarCity is guaranteeing I can transfer the agreement (assuming the buyer agrees to take on the agreement), move the solar panels (if my new home is local), or allow me to pay off the remaining balance without termination fee. If my roof needs to be changed, it will cost me one $499 for SolarCity to remove and re-install the panels. 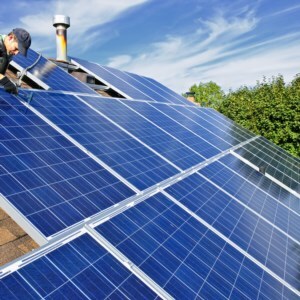 Solar panels degrade about 0.5% a year. Dust on the solar panel will account for no more than 2-3% loss. On a cloudy day, the panels will still generate around 60% power. This number seems high to me. PPA stands for Power Purchase Agreement. What it basically means is SolarCity puts solar panels on your roof for free, but instead of paying PG&E their rate for power, you'll pay SolarCity for power. In this rate, my opinion is I'm merely switching providers from PG&E to Solar City. Unfortunately, because there is a ladder in percentage of rate increase, I feel like this "ladder" equates more to a ARM Loan where you guess and hope for the best, but could end up being bad news in the future. In the end, I had a feel that I would save money with either the PPA or direct purchase, but I didn't believe that the amount saved would be that much. The main problem being that PG&E gives a horrible return on excess energy produced. If the rate offered by PG&E were more reasonable (and I understand why PG&E as a company doesn't want to improve the rates), then solar would be more attractive. But change in this arena needs to happen at the county/state level first before PG&E can be persuaded to change. I do one day hope to get solar, but when the incentives offered are more concrete.